Mon, Apr 8, 2019, 11:56 pm SL Time, ColomboPage News Desk, Sri Lanka. Apr 08, Kandy: Megapolis and Western Development Minister Patali Champika Ranawaka said Sri Lanka's hill capital city of Kandy will be developed as a strategic city, with World Bank funding of Rs.11 billion. Speaking at the opening of George E. De Silva Park in Kandy built at a cost of Rs. 173 million Monday, the Minister said the World Bank is providing Rs. 11 billion for the strategic development of the historic city. 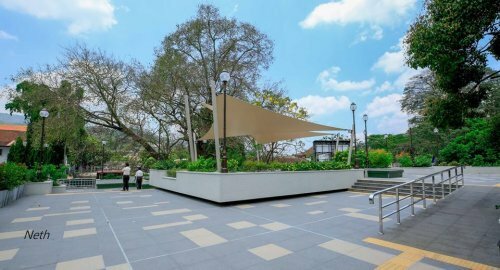 "We have invested Rs.173 million in the construction of the George E. de Silva Gardens. In the future, we are going to build a central bus stand and a railway station at Kandy Goodshed premises. For this, we constructed a bus terminal at a cost of 182 million rupees and handed it over to the public. We have also provided Rs. 156 million to the municipal council to be allocated to the irrigation department for necessary equipment. The 842 residents who have been affected by this development project will be given compensation," he said. He said Rs. 11 billion will be spent to construct the Kandy city as a strategic town. Massive funds have been allocated for a large vehicle park. He said the first step to modernize the train station commenced today with the construction on an 11-storey central building that would provide accommodations for railway workers. Another Rs. 1.56 billion has been allocated for the machinery and other facilities required for their technical activities. Other developments for the rail transport sector are also planned, which will ease traffic congestion in Kandy. The only solution to reducing traffic congestion is to strengthen public transport, he said. "And especially this city is a very beautiful city. A tree planting program has been started under the Sahasak Thuru program in the city. It also requires the permission of all the businessmen to make this city an historic city as well as a model city." The Minister said there will be no place for erecting shanties and trade stalls in the city he expects the development board will see to it in the future.